Gabrielle Crosby has been incarcerated for three years. She has seven more to go. Yet, one Thursday a month she visits South Africa. She smiles and waves joyfully to the children at Sunflower House Hospice, then catches her breath and stands tall as she and a choir of inmates begin the first notes of “Little Bit of Me.” The women sing; they perform a puppet show; and when the children respond in song, they listen, eyes beaming. Gabrielle was introduced at the event (themed Own It: The Power in our Story) by the warden at ORW, Ronette Burkes. Cheering from the audience were five fellow choir members. 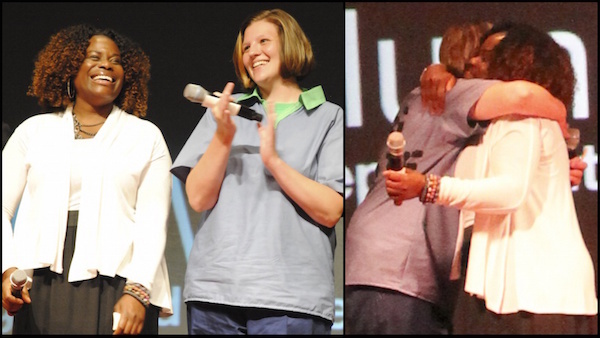 Warden Burkes had arranged for the inmates to attend the event both to support Gabrielle (not only is she the first prisoner to speak from the stage at a public TEDx, because of prison protocol she was not told when or where until just a few hours before) and so that they could participate and interact with the world that they will soon be reentering. If all this doesn’t exactly fit with what we think we know about prisons, actually, says Burkes, safe contact with the outside world is an essential part of rehabilitation. And towards this mission, the Harmony Project has been a perfect partner. Under the direction of David Brown, the Columbus nonprofit harmonizes voices through singing and communities through service and education. There are a number of choirs under the Harmony Project umbrella, and Brown says he runs Inside/Out the same way he runs all his choirs—which is to say, very unlike every other choir you know. In David Brown’s choirs, no one has to audition, but everyone has to serve. The result is diversity, not just of ability, but of age, culture, religion, orientation, and affiliation. Choir members sing together and serve together—painting murals, tending gardens, building playgrounds—and they break bread together. The Harmony Project creates opportunities for families with different histories and points of view to sit at the same table and share a meal. 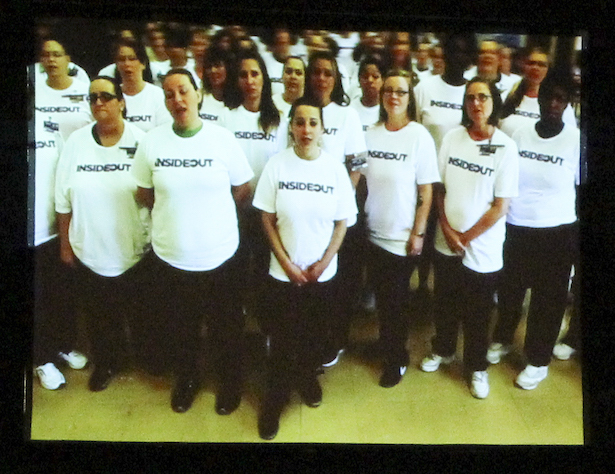 Though the logistics are more complicated, the Inside/Out choir is no different. They serve children across the globe by singing, sharing their love and connection, and making homemade toys and supplies however they can—last year they sent 700 pairs of hand-knitted socks to the Sunflower House community. They also break bread with different families. At ORW, inmates, guests from Columbus, and correctional officers dined side-by-side. Likewise, one evening a small group of inmates were able to join a dinner hosted by the Harmony Project in Columbus. On the TEDx stage, Gabrielle spoke about the transformation the choir helped bring to her own life. She and many women at ORW are mothers separated from their own children. Gabrielle is mom to three, and the separation from her youngest, born a few months into her prison term, sent Gabrielle into the darkest period of her life. Across the ocean, the terminally ill children in South Africa are also separated, many of them, from their own mothers. 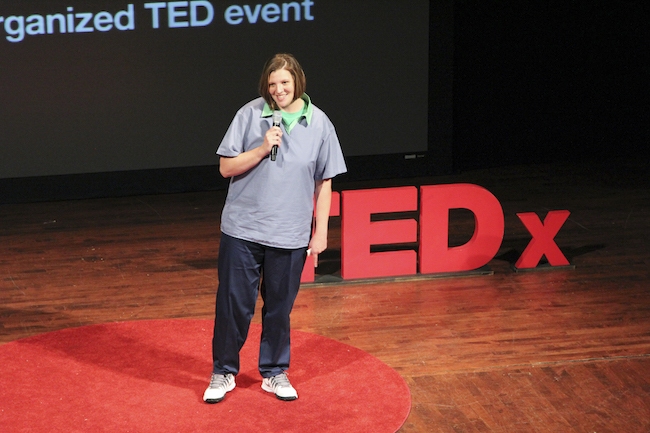 Kendra Hovey is editor at TEDxColumbus: Follow This. On Twitter @KendraHovey, she blogs at kendrahovey.com, more of her writings are on Medium.